The current flag design of Puerto Rico were adopted by the commonwealth of Puerto Rico but the design can be traced all the way back to 1868. The "Grito de Lares" was the flag used to represent the Puerto Rican people's displeasure with the Spanish ruled government at that time. This flag was a representation of rebellion. This flag included a white Latin cross in the middle which divided the flag into four sections. The two lower corners were red and the two upper corners were blue with a white star in the upper left blue corner. 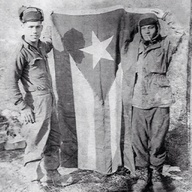 According to Puerto Rican poet Luis Lloréns Torres the white cross on the flag represents the yearning for homeland redemption for the people of Puerto Rico. The red squares represent the blood poured by soldiers of the Puerto Rican rebellion and the white star in the upper left blue section stands for liberty and freedom. The current flag design of Puerto Rico consists of five red and white stripes. Three of the stripes are red, and the other two are white. There is also a light blue triangle with a one white star in it. Each section of the flag represents something significant to the people of Puerto Rico. The three red stripes represent the blood from the brave warriors who fought for Puerto Rico's independence. The two white stripes represent the victory and peace that they would have after gaining independence. The white star represented the island of Puerto Rico. The blue represents the sky and blue coastal waters. The triangle represents the three branches of government. Some people believe that the color structure is based on the flag of Cuba but with the colors inverted.